Coconut (Nariyal) is a super food used in various form such as coconut oil, coconut water and coconut fruit. Each part has medicinal value as well, so every part can be used for medicinal purposes. Coconut has several health benefits and its every part has a great medicinal value. According to Indian Traditional medicine and ayurveda, coconut has cooling effect on eyes. Eyes are source of fire element and eye diseases and vision loss occur due excess heat. Coconut water, coconut fruit and coconut oil helps to decrease the excess heat from the eyes and improves vision. Take dry coconut fruit about 20 grams. Grind to make powder of dry coconut fruit. Now, add 20 grams of grinded sugar crystals (mishri) in it. Mix both ingredients well and use 1 teaspoon daily. You should use this coconut remedy for at least six months. It improves the vision and helps in reducing numbers of your glasses. Make powder of dried coconut fruit, almonds, black pepper, Mishri and seeds of green cardamom. Take 1 teaspoon of this coconut almond remedy regularly twice a day preferably with milk. Coconut almond remedy is effective in reducing eye pain, water eyes, itching of eyes and burning sensation in the eyes. It improves vision. If you have to read books, do work on computer and use eyes continuously more than 3 hours, you should take this remedy to reduce the effects of strain on the eyes. It is highly recommended for students, computer works and other people who use their eyes excessively. Coconut does not only improve vision/eyesight, but it also benefits eye diseases, especially in conjunctivitis and eye flu. Wash your eyes with fresh coconut water. Drink 100 ml coconut water three times a day. Take fresh 50 grams coconut fruit. Crush it to make its powder. Take two slices of cucumber and paste coconut fruit paste on one side of cucumber slices. Now, lie down on the floor and close your eyes. Keep cucumber slices on the eyes and coconut paste should touch your eyes. This remedy soothes the eyes and reduces burning sensation, itching and watery eyes. There is a precaution using this remedy that you should not eat salt in your diet 3 hours before, during and 3 hours after the use of this remedy. Coconuts are natural remedy for male infertility. Infertility may have many underlying causes and one of them is oligospermia. Coconut pulp helps to treat oligospermia, improve quantity, motility and quality. It gives proper nourishment to the testes and improves it functions. Coconut works in two main problems related to male infertility. The coconut water, fruit, and coconut oil all can help in these cases. 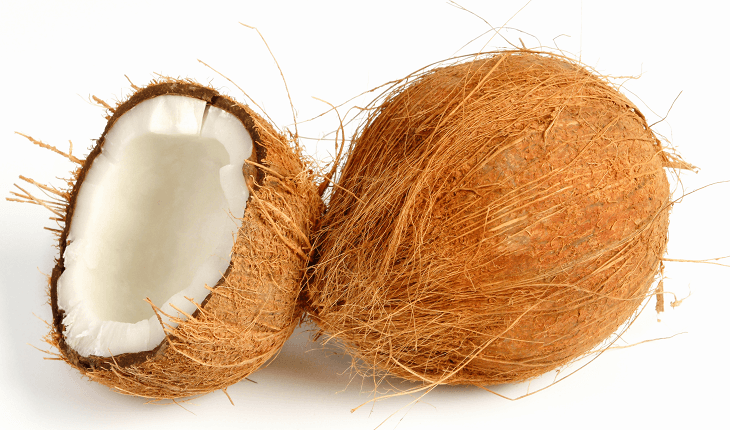 The following coconut remedy reported more effective in male infertility. Mix all ingredients and take 1 teaspoon twice a day with milk. It should be used for at least 3 to 6 months regularly for treating male infertility. Sometimes, some people experience loss of appetite due to asparagus powder in this remedy, so if you experience too, you can take following remedy to overcome this problem. The dosage will remain same, so you have to take 1 teaspoon twice a day for improvement. The common cause of nosebleed is hot temperature and dryness of the nose. It may lead to rupture of the blood vessels in the nose, which cause nosebleed. Eat 25 grams of coconut pulp daily in the morning on empty stomach. Massage your feet with coconut oil twice a day. Drink coconut water once a day. These tips using coconut should be followed for a week to cure the problem of frequent nosebleeds. Cracks in tongue generally occur due to Biotin Deficiency, but cracked tongue may be due to other reasons. A promising remedy for cracked tongue is coconut. Take one teaspoon of above mixture with milk or water twice a day. It helps in keeping your healthy pregnancy and prevents complications. Coconut pulp helps to strengthen the lungs and improves immunity. Eating 25 grams of coconut pulp daily reduces frequency of asthmatic attacks. Coconut dried pulp can treat the frequent attacks of migraine and chronic headache. Mix all ingredients and take with milk or water in the morning on empty stomach. Coconut is not known for this property, but it is a wonderful remedy for painful periods. Tribal people in India, especially in Kerala state use coconut oil for curing Dysmenorrhea. All parts of coconut tree can be used for this problem. You can generally avail coconut oil, coconut water and fruit. Their daily consumption can help you out with painful menses. However, coconut (Nariyal) may not induce menses, but it corrects hormonal imbalance, so it helps in bringing a proper menstruation. Coconut can help removing intestinal worms from the gastrointestinal tract. Drink coconut water about 250 ml. Eat 200 grams fresh raw coconut fruit after drinking coconut water. Continue taking this coconut home remedy for worms for a week. It will help to kill the intestinal worms. It is reported that worms are eliminated through the excretory opening during defecation after eating this coconut remedy for a week. It is a safe method to get rid of intestinal worms. It is effective in removing parasites from the abdomen. It improves the health of digestive system and balances acid production in the stomach. If you suffer from recurrent parasitic infestation, you should use this remedy for a month to prevent recurrence. This remedy is also effective in children and entirely safe as compared to anti-parasitic drugs, which may have many side effects and toxic effects in the body. The coconut remedy for worms does not cause anything wrong in the system. This coconut rehydration solution also helps to reduce frequency of loose stools and helps in reducing vomiting. This action is confirmed due to the coconut water and dried ginger powder. Dehydration occurs due to excessive vomiting and loose motions. However, the most common cause is diarrhea, but excessive sweating during summer can also lead to dehydration. The best natural hydration fluid is coconut water. It is also beneficial in reducing fever, diarrhea and vomiting. You can take coconut water during these diseases to prevent dehydration and aid in other symptoms. Coconut water aids in expelling kidney stones. It has property to prevent stone formation in the kidneys. This property is demonstrated by the alkaline properties of the coconut water. Coconut fruit and coconut water reduces burning sensation of the urine. It cleanses the urinary bladder and removes amorphous deposits from the bladder. This is generally present in patients with stones. Further, coconut water has antibacterial and antiviral properties, so its regular use helps to reduce urinary tract infections. Coconut water helps bringing down the temperature and provides instant energy to the patient. It can be used in thyroid fever along with orange juice. Coconut oil is a rare ayurvedic home remedy used for whooping cough, but it is too effective in reducing coughing. The common symptom of pertussis is prolonged coughing, which may be severe and result in extreme fatigue. Take 100 ml warm water. Add 4 ml coconut oil and 1 teaspoon of honey. Mix the coconut oil and honey in warm water. However, oil will float on the surface of water, but try to make a colloidal solution. Drink this water immediately and lie down on the bed for an hour. This remedy helps a lot in controlling and reducing severe and prolonged coughing attacks. Coconut oil is a very helpful remedy for hair fall. It prevents hair loss and removes dandruff from the scalp. The following remedy is useful in the treatment of dandruff and hair fall. Take 200 ml coconut oil and 5 fresh amla (Indian Gooseberry). Put coconut oil in heating pan and heat on burner. Crush amla, make paste and remove amla seed. Now, add amla paste into the coconut oil. Simmer the coconut oil with amla paste until the paste color convert to brown. Now, strain the coconut oil through the sieve. Apply this amla coconut oil on the scalp. It prevents further hair fall and increases hair growth. Take 20 ml coconut oil and 10 ml lemon juice. Mix both ingredients thoroughly and apply on the scalp. Do gentle massage with fingers. This remedy can be used twice a week. It helps in reducing dandruff and cures hair fall. Coconut oil is effective in this case. Coconut oil has aphrodisiac properties and enhances libido in both men and women. If you experience loss of libido due to any reason, you can replace your cooking oils with coconut oil. Coconut oil helps in reducing and treating generalized itching. The generalized itching may have several causes, but coconut oil works in all type of cases. It can also soothe the skin in patients with kidney failure in which generalized pruritus is a common problem. The following coconut oil remedy helps in itching. Mix both ingredients and apply on the skin. It reduces itching and moisturizes the skin, so it also cures excessive dryness the skin. Massage of nails with coconut oil increases nails and make them beautiful and glowing. Coconut oil gentle massage helps in reducing white spots, blemish and dark circles under eyes. The following remedies work excellently improving face glow and reducing blemishes and dark circles. Take 100 ml water in a vessel. Add amla powder and licorice powder in the water and boil the water with these powders. Simmer the water with amla and licorice powder for 2 to 3 minutes. Now add coconut oil and simmer the mixture until water evaporates entirely and oil remains. Now separate the coconut oil from other residues. Now, let it cool down and add 100 ml almond oil it remained coconut oil. Mix both oils and apply twice a day on face. Coconut oil is a great remedy for burns and scalds. It prevents burning, pain and soothes the burnt tissues. The following remedy is used in this case. Mix both ingredients and apply over the skin immediately or as soon as possible after burn. This coconut remedy prevents ulcer formation and reduces burning sensation. There was a misconception of using coconut oil for curing hypothyroidism, but there is no scientific proof for this claim. However, coconut oil is effective in reducing symptoms of hypothyroidism like fatigue and weight gain. It can be used as supportive in addition to thyroid medicines. Coconut oil is a healthy fat, which can be replaced with other cooking oil to reduce body weight. However, coconut oil is also a fat, but it improves metabolism in the body, which helps to burn the excess fat. It reduces appetite and boosts fat burning. It is reported to be more effective in cases of abdominal fat. Coconut (Nariyal) has cooling properties, so it is beneficial in bleeding disorders as well. According to ancient medicine, bleeding occurs when there is a heat in the body. Therefore, coconut plant remedies are effective in bleeding piles. However, in this remedy, coconut oil or fruit is not used. Coconut roots are used in the treatment of bleeding piles. Take coconut roots and burn them on burning stove. Make ash of burnt coconut roots. Now take 10 grams of coconut root ash powder and mix it with 10 grams of sugar powder. Take one teaspoon of this remedy with water three times a day before meal. It is an effective and time-tested natural solution for bleeding piles. A few pregnant women combat with frequent abdominal pain. However, this problem is not common, so you may also need immediate medical care. Along with medical care, you can take following mixture to prevent the pain and keep your child healthy. It is used in India believing that child born after using this remedy will be smart and intelligent. His/her skin will be glowing and gorgeous and it will remain same for a whole life. He/she will remain healthy for a whole life. However, this need scientific approval, but this belief is since 2000 years in India. This is same with orange fruits uses in pregnancy. Coconut water is safe to use in pregnancy. It helps reducing heartburn, acidity, acid reflux, constipation and nausea. Therefore, Indian doctors recommend its regular use during pregnancy, especially during first three months of pregnancy. You should use coconut oil in cooking during pregnancy. It contains lauric acid, which improves immune system of developing fetus. In case of nursing mothers, coconut oil helps to increase breast milk. All edible parts of coconut tree can be used in pregnancy and considered safe. Generally, it should provide a complete relief within 2 weeks. However, you can continue it for 2 to 3 months if required.